The sequel to the New York Times Best selling phenomenon, Hush, Hush! Nora should have know her life was far from perfect. Despite starting a relationship with her guardian angel, Patch (who, title aside, can be described anything but angelic), and surviving an attempt on her life, things are not looking up. Patch is starting to pull away and Nora can't figure out if it's for her best interest or if his interest has shifted to her arch-enemy Marcie Millar. Not to mention that Nora is haunted by images of her father and she becomes obsessed with finding out what really happened to him that night he left for Portland and never came home. The farther Nora delves into the mystery of her father's death, the more she comes to question if her Nephilim blood line has something to do with it as well as why she seems to be in danger more than the average girl. Since Patch isn't answering her questions and seems to be standing in her way, she has to start finding the answers on her own. Relying too heavily on the fact that she has a guardian angel puts Nora at risk again and again. But can she really count on Patch or is he hiding secrets darker than she can even imagine? Those of you who've read my review of Hush, Hush realize that while I found it enjoyable, I had my problems with it. I found Vee and Nora to be rather irritating at times, and I'm really [Image]dubious about the plausibility of the ending. Considering that I'm a little wary of Patch already, I'm not sure that I'll be jumping up and down with glee over this novel. However, you never know how the characters will develop, and I'm curious enough to give it a chance. Maybe I'll be pleasantly surprised! I super enjoyed Hush, Hush and it was my first real book ever in English, so... I way too excited for Crescendo. Hehe. I'm so happy I managed to pre-order it already! 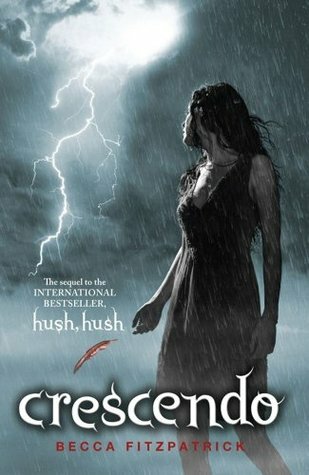 Oh, I loved HUSH HUSH, and am currently reading through my ARC of Crescendo. So far, so good! ^_^ Here's hoping you like the sequel perhaps a bit more than the 1st....happy reading! I really need to read this author, I have heard so many good things about her books!! !